Hi everyone. I made a card today inspired by three challenges. 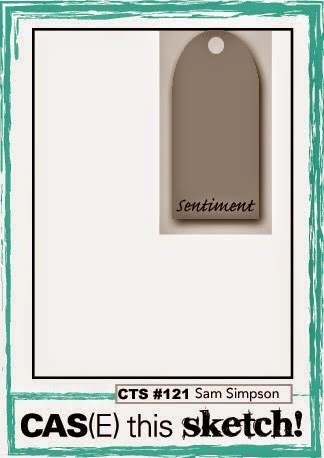 First the beautiful card done by Chrissie Stokes for Muse # 115. I just love her watercoloured images and the bold and vibrant colours on the black background. The other inspiration was the sketch from CAS(E) this Sketch #121, and I'm just squeaking in under the wire for the Less Is More Challenge #221 - Add a Tag. 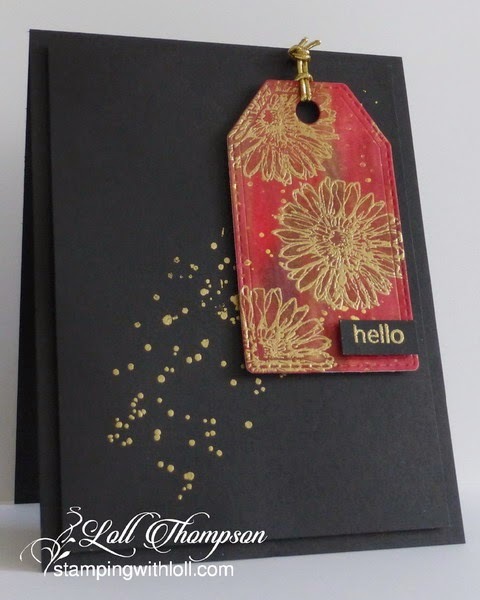 I cut out the piece described above with a tag die and then stamped over top with three blooms and heat embossed it in gold, along with embossing the sentiment in gold too. And I took some more pearl ex and water and splattered that background of the tag. I stamped the background of the card base with one of the stamps from Gorgeous Grunge and heat embossed it in gold as well. Loll, what a wonderful take on both challenges at Muse and LIM. This is completely stunning! I just love the drama of the red tag on the balck card base. How rich and elegant this looks, Loll! Another fantastic technique to try. Love it and a superb Muse on Chrissie's card. Gorgeously elegant, Loll. You've replicated the feel of Chrissie's card perfectly. Stunning with a capital "S"! Wow! So striking...what an awesome CASE! Perfect combination of the challenges, Loll! I love it! Absolutely beautiful, Loll. This is so rich and stunning and the gold splatters on the black really add the perfect touch. Loll, I just LOVE this dramatic card - I just pinned the faux glass technique video to explore later, thanks again for the inspiration. This is an awesome response the the MUSE inspiration. Gorgeous card - love the tag and the gold on the cardbase. 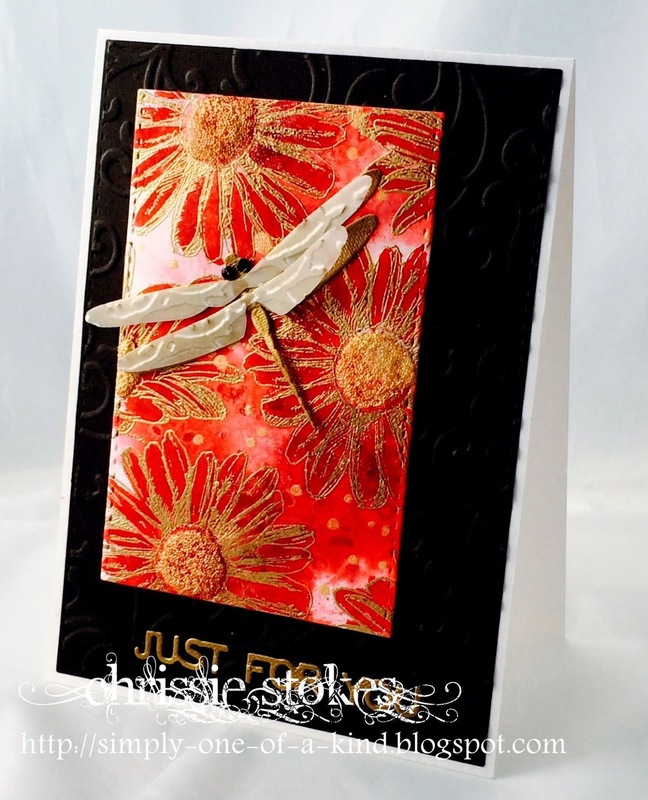 Love them dramatic effect you created - great take on Chrissie's card. Love it - reducing the scale of the busy red panel leaves lots of room for the dramatic black! So glad you joined us at Muse this week, Loll! Stunning card, Loll! Your blooms are amazing with this technique and the splatters look really cool against the black background! You did such a great job combining these challenges, too...Love this card! Fabulous! I love the layout and the tag really pops off the black! This is incredibly gorgeous. Love the gold splatters you added. Gorgeous! I love the gold! Fabulous take on the sketch! The red/gold tag is stunning, and set atop the black panel...oh my! Dramatic and striking!